The Rink Rats program provides opportunities for more children to learn about the great game of hockey. The program focus is for kids who wouldn't normally be exposed to the game, and the program is a core part of the HBF's mission to grow the game of hockey. 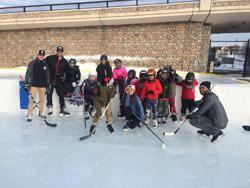 During the 2017-18 winter, the Herb Brooks Foundation hosted Rink Rats programs at 11 Minneapolis schools or local parks. In Minneapolis students participate in dryland training during the fall to learn the fundamentals of hockey and teamwork from professional coaches in a floor hockey setting before taking to the ice when outdoor park rinks open in January. The students continue the on-ice portion of the program until the ice melts on the outdoor rinks, usually in late February. Minneapolis schools that participated in the 2017-18 program include Seward, Waite Park, Hale, Hmong International Academy, Marcy Open, Jenny Lind, Bancroft, Sonnesyn, Green Central, Northrop, and Dowling Elementary Schools. The Rink Rats Program would not happen without the support of Minneapolis community services programs, the Minneapolis Park and Recreation Board, the cooperation of Minneapolis Public Schools, the National Hockey League Players Association and the generous sponsorship of Morrie’s Automotive Group, which is providing the student transportation from the schools to the local parks in Minneapolis. Other sponsors include Dave’s Sport Shop, the Butzow Foundation, the Minnesota Wild Foundation, Let’s Play Hockey, RBC Wealth Management, and the Minneapolis Police Activities League program. Registration for the 2018-2019 Rink Rats session is now open! Please follow the link below to register. Questions? Please contact your school's community education director.